Prostrate shrub to 1 m high. Branchlets slightly angular, red-brown, resinous towards apices, squamulose. Phyllodes tetragonous-terete in section, 9–14 cm long, 0.8–1 mm wide, glabrous, squamulose, with 1 strong nerve at each angle and 1 or 2 less obvious median nerves on abaxial and adaxial faces, 8 or 12 nerves in all; gland 1, basal, small. Spikes 1.2–2.2 cm long, golden. Flowers 5-merous, rarely 6-merous, widely spaced; calyx 0.6–0.9 mm long, dissected for 1/4–1/3, squamulose; corolla 1.7–2.5 mm long, dissected for 2/3–3/5, glabrous; ovary glabrous. Pods linear, tapered at both ends, scarcely moniliform, flat (old valves tightly coiled), 6–10.5 cm long, subwoody, reticulate, glabrous; margins fawn, prominent. Seeds longitudinal, elliptic, 4.8–5.4 mm long, light brown; pleurogram thin, closed, with wide halo; areole paler brown. Known only from the type locality in north-eastern Qld. Grows in brown loam, over Argentine schist, in open eucalypt woodland. Flowers July and Oct.
Acacia jackesiana belongs to a small group of species native to N Qld, viz. A. guymeri and A. whitei . Near Argentine Mine, 60 km WSW of Townsville, Qld, 8 Oct. 1976, E.M. & B.R.Jackes ; holo: BRI; iso: NSW and n.v .: A, BRI, CANB, K, L, MEL, MO, PR. 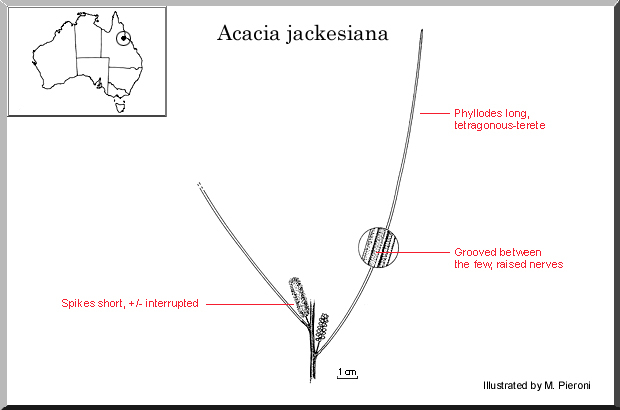 Racosperma jackesianum (Pedley) Pedley, Austrobaileya 2: 350 (1987). Type: as for accepted name. Qld: near Argentine Mine, N.Hall 82/13 & E.M.Jackes (NSW).